The Tiger Collection features two Tiger II’s: the Tiger II (Pre-Production) tank and the Tiger II (Production) tank. More powerful than Tiger I, it could destroy any Allied tank. 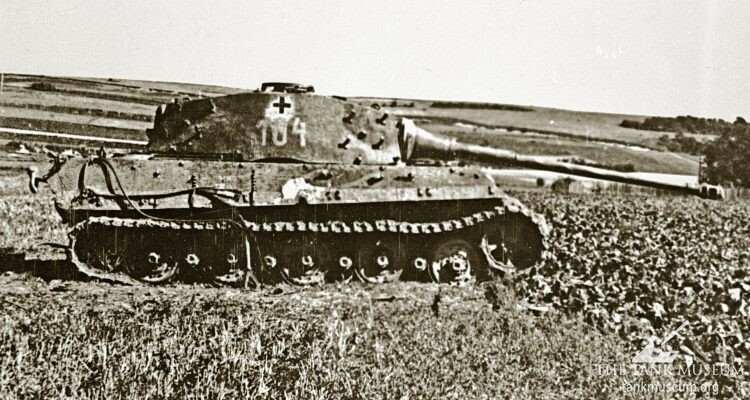 Tiger II or ‘Konigstiger’ (King Tiger) was first used during the Normandy campaign in 1944 and was the most powerful tank on the battlefield at that time. Despite its overwhelming superiority, the tank suffered from fuel shortages, technical problems and the bombing of factories meant too few were manufactured to have a real impact on the fighting. An abandoned Tiger II, with white flag flying, being inspected by American troops, in the Ardennes, France 1945. 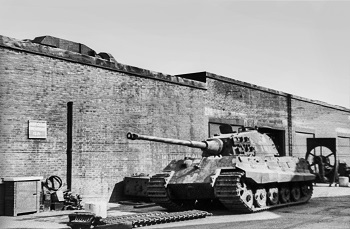 When Henschel won the contract to build the Tiger II (VK4502 H), the armaments manufacturer Krupp designed the turret to fit both the Porsche and Henschel chassis. The initial design called P-2 Turm, mounted a single piece barrel 8.8 cm gun and had a curved mantlet. A new design was ordered to fix a shot trap problem which had a two piece barrel. This design called Serien Turm, or commonly known as ‘Henschel’ or ‘Production’ turret, was to retain many features from the earlier turret when accepted for mass production. 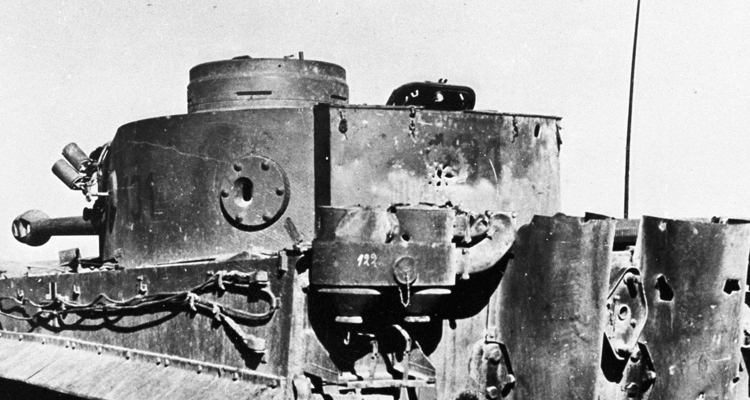 The front curved was mantlet replaced with a single 180 mm armour plate sloped at 81 degrees. The sides were altered to slope at 69 degrees, and it could carry an additional 6 rounds or 22 belts of machine gun ammunition. The Tank Museum’s captured Tiger II of 1 Schw SS Pz Abt. Heavy SS Tank Battalion 101, at Fighting Vehicle Proving Establishment, Chertsey, January 1945. 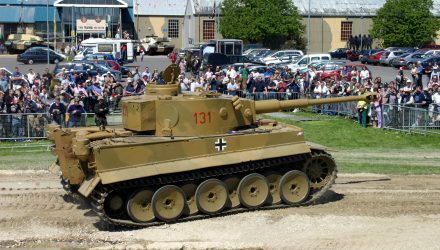 The Tiger II’s full combat weight was 68.5 tonnes when fitted with the earlier turret and 69.8 tonnes when fitted with the ‘Henschel’ turret. 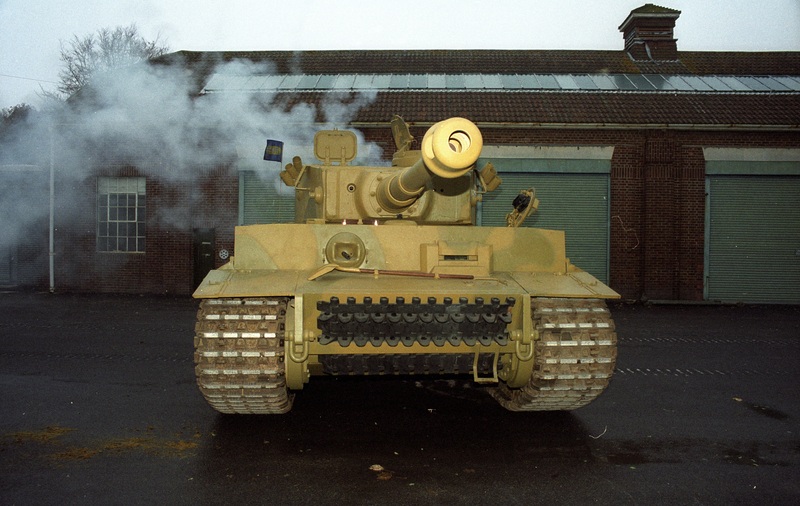 As part of an improvement programme, Tiger II’s engine was due to be upgraded to the more powerful Maybach 234 fuel injection engine. 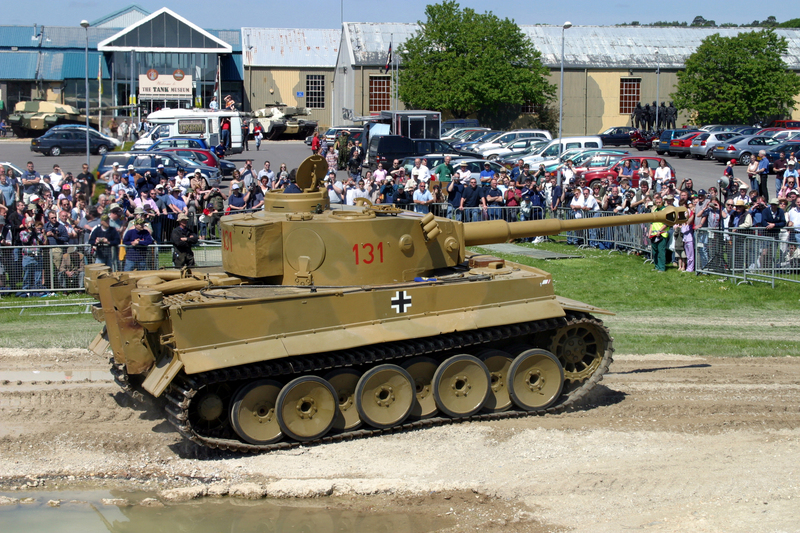 The Tiger II in the exhibition, Panzerkampfwagen VI Ausf B (Sd Kfz 182), was issued to SS Panzer Battalion 101 and commanded by SS-Oberscharfuhrer Sepp Franzl. 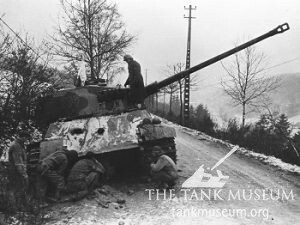 On 30th August 1944 the tank broke down at Magny-en-Vexin in northern France and was abandoned by its crew. From his Sherman tank, Sergeant Roberts of the 23rd Hussars then put two 75mm rounds into the left side above the track – damage which is still visible. 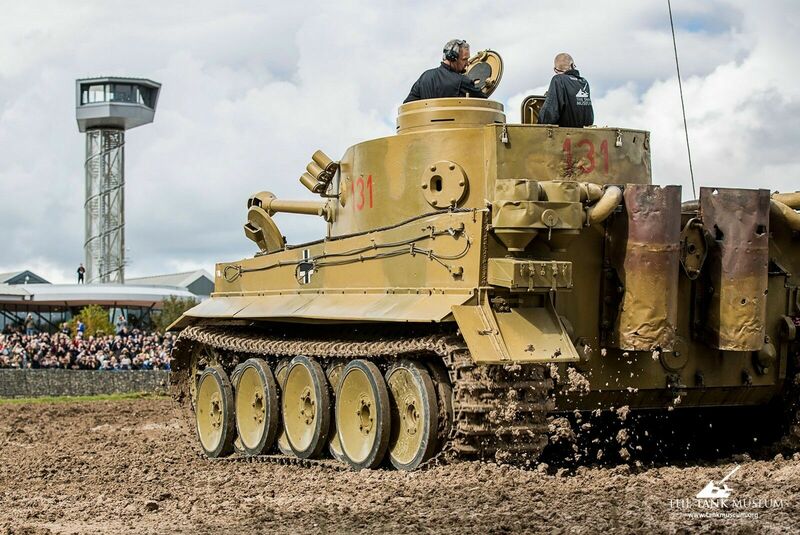 See the Production Tiger II at The Tank Museum’s new exhibition, The Tiger Collection – the Tanks, the Terror & the Truth, opening in April 2017. Your text says that the two 75mm rounds hit the tank on the left side, but the photos clearly show the damage being on the right side of the tank. Also the fifth paragraph of the text starts “The front curved was mantlet replaced…” – I think the two words “mantlet” and “was” have been transposed, and the text should read “The front curved mantlet was replaced…”.